**Thanks to my great SIL Melinda for posting her menu this week. I used some of her ideas for my menu this week. Go ahead and post your menu this week! Thanks! 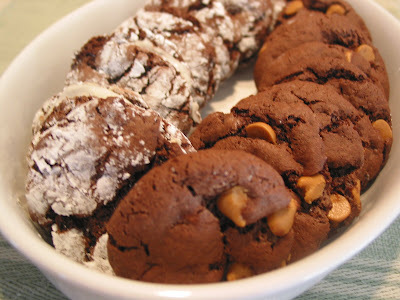 Here's a easy recipe for two kinds of cookies using a cake mix! 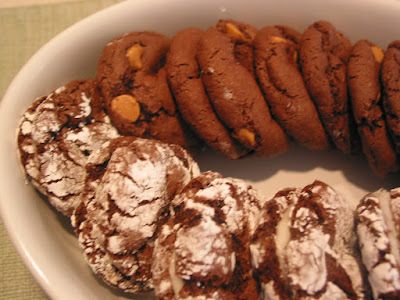 Roll chocolate cookie dough into balls and roll in powdered sugar. Bake at 350 for 9 minutes. When cookies are cool, frost bottom of cookie and top with another cookie making a sandwich. Mix peanut butter chips (1 c.) into chocolate cookie dough. Form into balls. Bake at 350 for 9 minutes.